Spaß und Liebe zum Oldschool HipHop standen für die sechs Freunde von Anfang an im Mittelpunkt, obwohl sie sich in den Tiefen der Problemviertel L.A.’s zu Jurassic 5 zusammenschlossen. Ursprünglich aus zwei Crews bestehend, beschlossen die vier MCs (Chali 2na, Zaakir, Akil und Marc 7) und zwei DJs (Cut Chemist und Nu-Mark) nach mehreren gemeinsamen Jams, die HipHop Welt zusammen als Kollektiv „Jurassic 5“ aufzumischen. Sie widmen sich lieber locker-luftigen Oldschool-Klängen, die Positivität und Lebensfreude ausstrahlen, ihren kritischen Kern und die inhaltliche Tiefe aber stets bewahren, anstatt den Ghettoalltag zu verherrlichen. Mit der selbstbetitelten EP „Jurassic 5“ (1998) und dem Debütalbum „Quality Control“ (2000) schafften es die Kalifornier deshalb innerhalb kürzester Zeit mit Hymnen wie „What’s Golden“ oder „Work it out“ weit über die Stadt der Engel hinaus in die Herzen der Rap-Fans. Ob Lauryn Hill oder The Roots - Jurassic 5 haben seit ihrer Gründung in den frühen Neunzigern mit etlichen namhaften Künstlern der HipHop-Szene zusammengearbeitet. Mittlerweile gelten sie als eine der besten Live Rap-Crews überhaupt und werden in einem Atemzug mit Mos Def oder Talib Kweli genannt. Communicating Vessels' recording artists Shaheed and DJ Supreme are one of hip hops' most consistent groups. They hail from Birmingham, Alabama, but you won’t find them categorized among the typical dirty south artists. They are, in fact, seen as practitioners of traditional boom-bap hip hop. The duo, who have worked together since 2000, began this collaboration in 2007 and have an impressive track record to authenticate their expertise. They've released two critically acclaimed LPs (Health Wealth & Knowledge of Self and Scholar Warrior (The Remix Album)). They’ve shared stages with Raekwon, Atmoshpere, Brother Ali, DJ Shiftee, The Bodega Brovas, and Stalley, as well as, labelmates The Green Seed. And their albums feature guest appearances from artists such as Akil the MC (of Jurassic 5), Amir Sulaiman, and W. Ellington Felton. In 2013 they released their highly anticipated third LP, Knowledge, Rhythm, and Understanding. This was their debut label release and Communicating Vessels knew Shaheed’s skillful lyrical agility and DJ Supreme’s soulful production would leave listeners perfectly inspired. It received high praise, including being listed with CMJ’s best Hip Hop albums released that year. 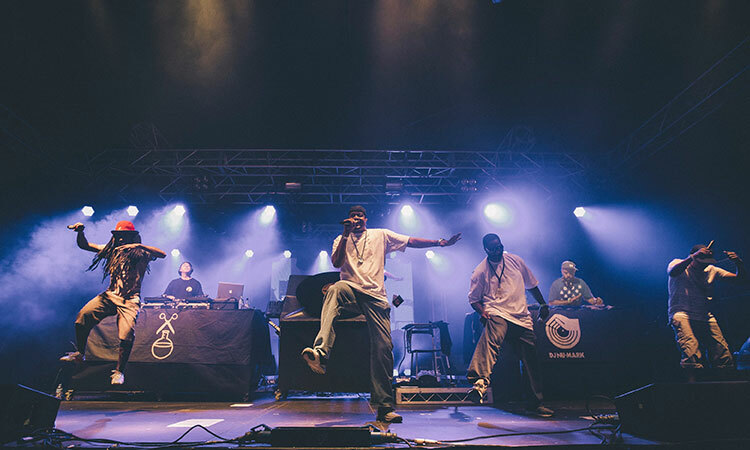 Since its release they have continued to woo crowds both locally and on international platforms having toured overseas twice with legendary group Jurassic 5. Their work never ceases and their next album will boast those same refined techniques by DJ Supreme which create an unimaginable space for Shaheed’s proficient lyrical freedoms. It will also have plenty of all star guest performances so anticipation should be set to an all time high.